I just finished my first session on the Slingshot Celritas 5’6”. I liked it. It was a sub optimal day, gusty 12 almost totally on shore, waist to chest high on the outside but choppy. I am looking forward to riding that board on a good day. I had to get dialed in for my bottom turns, at first I wasn’t holding my line well but it got better as it went on. I think every board is a little different and you have to adjust your sailing a bit for each new board. It was snappy off the top though and not bouncy just riding. The nose isn’t as flipped up as I normally like. It doesn’t really effect the riding but I did dig the nose in once coming over the back of one. The next day was similar but a bit more wind and surf. More challenging. The Celeritas preformed very well in these conditions. Onshore, gusty, challenging closeouts. I liked that the Celeritas rode very smootly, it really didn’t bounce around a lot in the chop. I sticks in the water well. 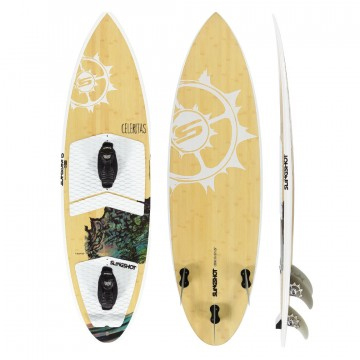 Now I’ll have to either make room for three surfboards in the back of the truck or figure out by specific conditions which days to have the Celeritas in the truck and which days to have the Naish Skater 5’4″. I think Skater when its clean but not too big and Celeritas for the onshore days. I guess the secret may be that if it isn’t forecast to be big surf then leave the small board in the shed and maximize your available quiver for the most likely surf. When it looks to really rip or be big throw the Naish Global in there.